During the recent Third Conference on Supporting the Future of Syria, in Brussels, the USA decided to allocate $5 million to the White Helmets, a decision which has once more turned the spotlight onto that organization. It first emerged in 2013, under a banner of political neutrality: a non-partisan NPO formed of volunteers who carried out humanitarian missions, and its members were promptly branded as heroes by the media. They were represented as people who rushed to rescue their fellow citizens in the face of savage bombing raids by government forces: saving lives, providing first aid etc. According to the White Helmets, its volunteers have “saved” some 115 thousand people in the years since the organization was founded. This figure was taken at face value by Western officials and media, and has been endlessly repeated. In addition to their humanitarian mission the “rescuers” prepared various materials from the front lines of the conflict in Syria. They posted photographs and videos of bombed hospitals, schools and mosques on their social media accounts as evidence of the “evil” of the Damascus regime. They focused on producing content that would touch viewers in the West on a raw nerve. So they emphasized, above all, the suffering of Syrian children: the victims of shooting, bombing and other horrors of war. All these materials were directed at a mass audience, and their creators were highly praised and awarded a number of international prizes. In 2015, for example, the White Helmets were awarded the Alternative Nobel Peace Prize – worth approximately € 50,000. 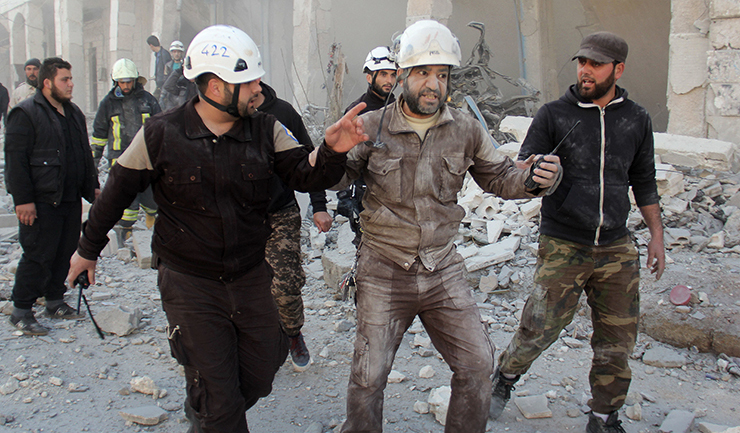 The film The White Helmets won an Oscar in 2018 for the Best Short Subject Documentary. Nevertheless, all this tub-thumping is unable to hide certain inconvenient facts. Particularly, the fact that, ever since the organization’s brigades first appeared on the scene they have operated exclusively in areas outside the control of the Syrian government and controlled by armed opposition groups, including DAESH and the Al-Nusra Front (Editor’s note: both organizations are banned in Russia). These groups punished the slightest insubordination in the areas they controlled. The White Helmets’ claims that they remained politically independent when active in these areas are therefore rather unconvincing. Their members accepted the new status quo and were loyal to the militants, which naturally played into the militants’ hands. According to experts from a number of different countries, members of the White Helmets were drawn into the conflict In March 2017 on the side of the armed opposition groups, and provided them with various kinds of support. In March 2017, Abu Jaber, one of the leaders of the Al-Nusra Front expressed his sincere thanks to the White Helmets, calling them the “unseen warriors of the revolution”. It is not for nothing that a number of Arabic media have described the organization as “White Helmets under a black flag”. That did not prevent their sponsors from the West and the Middle East from generously financing their activities. The organization’s director admits that it has received money from government and private donors in the USA, the United Kingdom, the Netherlands and a number of other European countries as well as Turkey, Qatar and other Persian Gulf states. The largest donor has been the United States Agency for International development (USAID), which paid the White Helmets at least $23 million between 2013 and 2016. The special services also lent a helping hand. One of the movement’s founders and inspirers is James Le Mesurier, a former British intelligence officer and soldier who has fought in Bosnia, Kosovo and the Lebanon. He is the head of the Mayday Rescue Foundation which supported the White Helmets using funds it received from donors, including $4.5 million from NGOs in the Netherlands and the same amount from donors in Germany. The activists did their best to earn the funding and donations they were given.The organizations posted false reports on its social network accounts. It actively took part in a public relations campaign accusing the Syrian authorities and their allies of using chemical weapons. The USA and its allies cited the materials fabricated by the White Helmets. These materials were used in meetings of the UN and the Organisation for the Prohibition of Chemical Weapons to prepare the ground for resolutions and other measures, including military intervention, against the Syrian government. The White Helmets played a very underhand role as agents provocateurs, by fabricating chemical weapons attacks in the town of Khan Shaykhun, in Idlib Province on 7 April 2017, and in East Douma in April 2018. There was no proof of responsibility, but that did not prevent the USA from attacking the Syrian air base of Shayrat in response to the first of these incidents, after which the USA, the UK and France launched missile attacks against a number of targets in Syria which were allegedly connected with the manufacture of chemical weapons. As the rebels have lost territory in Syria, the areas in which the White Helmets operate has been reduced. The situation has changed dramatically, and in 2018 the organization went through a “very difficult time”, as Raed Saleh, the head of the group has acknowledged. In June 2018 the Israeli army helped with an urgent evacuation of several hundred so-called rescuers belonging to the White Helmets from Syria, along with their families. Many of the countries that supported the organization declared that they were ready to accept these refugees and provide them with support. The story of the White Helmets is an example of a new kind of media project: one with a strong humanitarian element, which unfolds in front of the public’s eyes. This project was launched following the failure to topple the Syrian government, as had been done in Libya. When it became clear that Bashar Assad’s presidency was not about to collapse, then his opponents initiated a long-drawn-out siege. And one of their main weapons was the White Helmets, with foreign support. The White Helmets now resemble a terminally ill patient who is confined to bed and scarcely breathing. Now that the terrorists have been defeated in most parts of Syria, the organization has exited the stage – the only region where its members are still partially active is Idlib Province, which is not yet under government control. But will the latest grant of funds, which the US lobbied for in the Brussels conference on Syria, be able to help save this chronic invalid? It seems unlikely. On the contrary, it will merely go to prove, once again, who the White Helmets are supported by, and whose interests they really represent. Yury Zinin, Leading Research Fellow at the Moscow State Institute of International Relations (MGIMO), exclusively for the online magazine “New Eastern Outlook”.